For 20 years, APA’s Nashville office has kept several of the music industry’s most recognizable names on the road and in front of their fans. The company celebrated its long and continuing run with a bash at Hard Rock Cafe last night (Feb. 18), attended by a slew of artists and industry. Presiding over the event were Sr. VPs Bonnie Sugarman and Steve Lassiter, who recently spoke exclusively with MusicRow about APA’s history in Music City. After joining APA in 1983 as Head of Fairs & Festivals, Bonnie Sugarman worked with Country artists including Dottie West, Tennessee Ernie Ford, The Gatlin Brothers, and Johnny & June Carter Cash. Sugarman transferred to Music City in the early 1990s to help oversee APA’s then-new Nashville office. “I knew we had to be [in Nashville], and we should have been here long before we were, because we represented Johnny and June Cash and the Gatlins at one time. Other agencies were coming to Nashville, so I volunteered to move here and loved it immediately. I used to come for the CMA Awards and the SRO awards, so I knew a lot of people even before I moved to Nashville. I knew APA needed a presence in Nashville, but I’m not sure I knew we would still be here 20 years later.” Sugarman is now APA Nashville’s Sr. VP/Head of Fairs and Festivals. Together, Sugarman and Steve Lassiter, Partner/SVP/Head of Concerts Department, lead an agency that represents more than 50 artists and employs more than one dozen agents. Among the artists that APA Nashville represents are Dolly Parton, Charlie Daniels Band, Travis Tritt, and Maggie Rose. Lassiter joined APA Nashville in 1998. 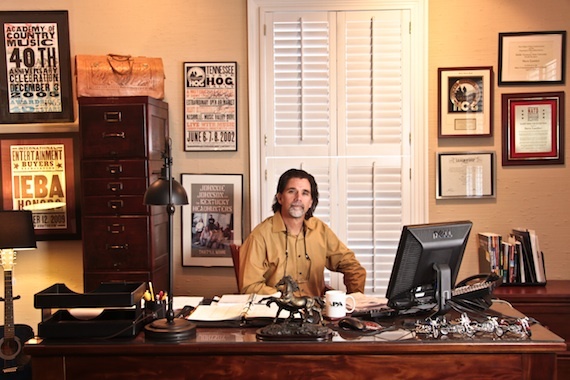 Prior to that he spent 12 years at William Morris Agency, where he booked concerts in the Southeast territory, rose to a VP role, and navigated tours for Trisha Yearwood, Charlie Daniels, The Oak Ridge Boys, and others. Both Lassiter and Sugarman have earned numerous accolades along the way. In 2005, the Nashville Association of Talent Directors (NATD) named Lassiter Talent Director of the Year. He has served as both President and Board member for the NATD; he has also served on boards for the ACM and the International Entertainment Buyers Association. In 1995, Sugarman made NATD history when she was the first woman awarded the organization’s Agent of the Year award. The following year, she made history again as the first agent to win the award for two consecutive years. Sugarman, a member of the 2010 class of Leadership Music, was honored with the Hubert Long Award in 2005, and currently serves as the first VP of NATD. APA Nashville has enjoyed several recent signings, including Tate Stevens, Maggie Rose, Mallory Hope, Jacob Powell, and band Strung Like A Horse. On the road, developing artists can tighten their performing skills, build an audience early in their careers, and help determine what songs and sound elicits a response from concertgoers.